Deep vein thrombosis (DVT) is a condition that occurs when a blood clot forms in a vein deep inside a part of the body. 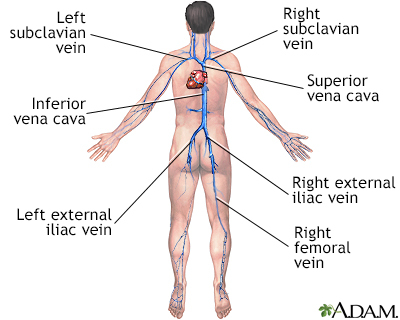 It mainly affects the large veins in the lower leg and thigh, but can occur in other deep veins such as in the arms and pelvis. 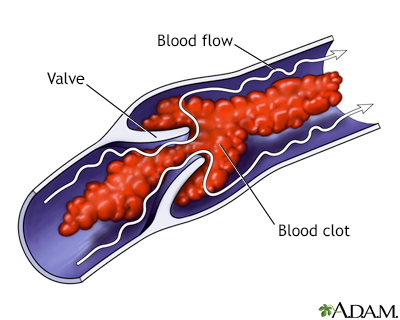 DVT is most common in adults over age 60. But it can occur at any age. When a clot breaks off and moves through the bloodstream, it is called an embolism. An embolism can get stuck in the blood vessels in the brain, lungs, heart, or another area, leading to severe damage. Sitting for long periods when traveling can increase the risk for DVT. This is most likely when you also have one or more of the risk factors listed above. Your health care provider will perform a physical exam. The exam may show a red, swollen, or tender leg. A pelvic MRI may be done, if the blood clot is in the pelvis, such as after pregnancy. Your provider will give you medicine to thin your blood (called an anticoagulant). This will keep more clots from forming or old ones from getting bigger. Heparin is often the first medicine you will receive. If heparin is given through a vein (IV), you must stay in the hospital. However, most people can be treated without staying in the hospital. Low molecular weight heparin can be given by injection under your skin once or twice a day. You may not need to stay in the hospital as long, or at all, if you are prescribed this type of heparin. One type of blood thinning medicine called warfarin (Coumadin) is often started along with heparin. Warfarin is taken by mouth. It takes several days to fully work. Another class of blood thinning medicines works differently than warfarin. Examples of this class of medicines include rivaroxaban (Xarelto), apixaban (Eliquis), dabigatran (Pradax), and edoxaban (Savaysa). These drugs work in a similar way to heparin and can be used right away in place of heparin. Your provider will decide which medicine is right for you. You will most likely take a blood thinner for at least 3 months. Some people take it longer, or even for the rest of their lives, depending on their risk for another clot. Take the medicine just the way your provider prescribed it. Ask the provider what to do if you miss a dose. Get blood tests as advised by your provider to make sure you are taking the right dose. These tests are usually needed with warfarin. Learn how to take other medicines and when to eat. Find out how to watch for problems caused by the medicine. Follow any other instructions you are given to treat your DVT. DVT often goes away without a problem, but the condition can return. The symptoms can appear right away or you may not develop them for 1 or more years afterward. Wearing compression stockings during and after the DVT may help prevent this problem. Call your provider if you have symptoms of DVT. Wear the pressure stockings your provider prescribed. Moving your legs often during long plane trips, car trips, and other situations in which you are sitting or lying down for long periods. Take blood thinning medicines your provider prescribes. DO NOT smoke. Talk to your provider if you need help quitting. Kearon C, Akl EA, Ornelas J, et al. Antithrombotic therapy for VTE disease: CHEST guideline and expert panel report. Chest. 2016;149(2):315-352. PMID: 26867832 www.ncbi.nlm.nih.gov/pubmed/26867832. Kline JA. Pulmonary embolism and deep vein thrombosis. In: Walls RM, Hockberger RS, Gausche-Hill M, eds. Rosen's Emergency Medicine: Concepts and Clinical Practice. 9th ed. Philadelphia, PA: Elsevier; 2018:chap 78. Lockhart ME, Umphrey HR, Weber TM, Robbin ML. Peripheral vessels. In: Rumack CM, Levine D, eds. Diagnostic Ultrasound. 5th ed. Philadelphia, PA: Elsevier; 2018:chap 27. Siegal D, Lim W. Venous thromboembolism. In: Hoffman R, Benz EJ, Silberstein LE, et al, eds. Hematology: Basic Principles and Practice. 7th ed. Philadelphia, PA: Elsevier; 2018:chap 142.